Ultimate Lifestyle. Sophisticated Living. Perfectly Located.. The Marquis on Maple! 55 well-defined 2 & 3 bedroom residences. 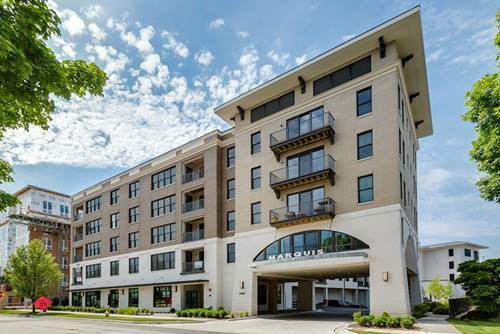 Distinctive architecture, outstanding location in the heart of vibrant downtown Downers Grove. Entire first floor is devoted to luxury amenities. Magnificent lobby leading to furnished resident lounge w/ FP and TV, private club room w/ full kitchen, bar and access to front landscaped patio. Fitness center with state-of-the-art equipment. Stunning & unique outdoor courtyard offers gas grill, fire pits, social seating & dog-walk area. Units feature expansive windows, gourmet kitchens w/ 42" Aristocraft cabinetry, quartz|granite countertops w/ subway back-splash, G.E SS appliances, solid 8" doors w/ chrome hardware, Kohler plumbing fixtures, 5" plank engineered floors, generous private balconies & smart home ready. In|out door deeded parking. 2 elevators, storage & bike racks. Walking distance to Metra, schools, downtown restaurants & shops. Living at it finest! For more information about 940 Maple Unit 211, Downers Grove, IL 60515 contact Urban Real Estate. Listing provided by Roman Properties, LLC.